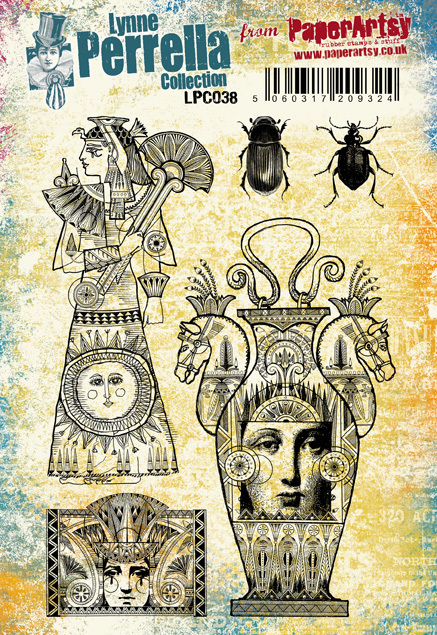 You are in for a treat - we have a surprise release of 3 gorgeous stamps from Lynne Perrella. She is in the UK this weekend teaching her magnificent tips and tricks to a lucky group of people up in Scotland. To coincide with this trip, we asked her earlier in the year if she would consider releasing some more stamps with us. And how exciting it is that she agreed to find time in her busy schedule to do so! 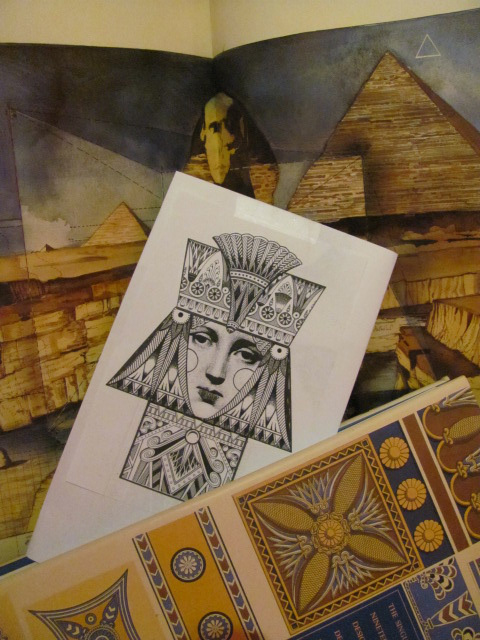 We adore everything Lynne creates, and in this collection she has explored all things Egyptian. I'm going to hand over to Lynne to explain some details about her design process. 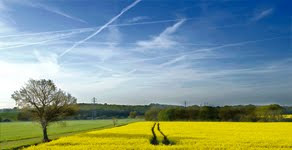 I enjoy exploring themes that have timeless appeal, interpreted in a contemporary context. Ancient Egypt has always inspired me since 1978, when we saw a noted exhibit about King Tut’s tomb at the Metropolitan Museum of Art. I can still recall the moment when we had inched our way through the long lines, and finally stood before the magnificent golden mask that once covered the Boy King’s face. This iconic relic inspired both awe and protective feelings; as well as total admiration for the crafts people who had created such a singular artifact. Glistening priceless gold, combined with details of lapis and other rarities, the face covering was, quite literally, fit for a King. I recently read a novel, “The Visitors” by Sally Beauman, and this atmospheric mysterious book re-tells the story of noted archeologist Howard Carter, and his discovery of King Tutankhamen’s tomb in 1922. Reading the book re-awakened my interest in Ancient Egypt, and I started sketching, and doing more research. I wanted this collection to be literally encased with intricate detail and feathery marks; a tribute to revered hieroglyphics as well as clothing, jewelry and palace details of the era. Another influential book, “Flight Into Egypt” by Timothy Ely reminded me that tales and stories can be told through images and marks, without need of words. 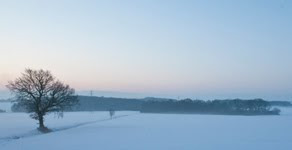 I created a collection of images, in various sizes, to encourage the stamper to make up stories and go overboard with the themes of Mystery and Excavation. I love exploring faces in my artwork, and wove those into portraits that include ancient/elegant urns, and inscribed details from historic walls. I enjoyed coming up with a swatch of fanciful “faux” exotic lettering that could be used as texture. 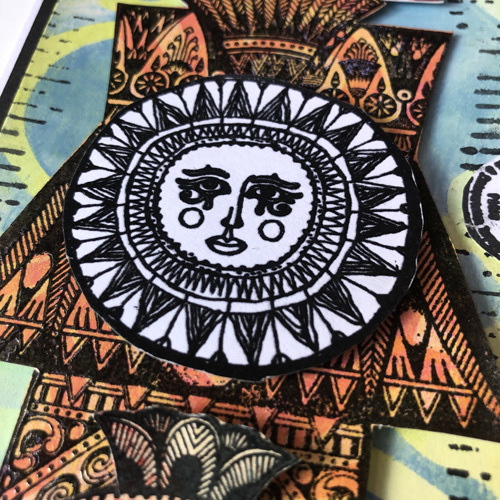 The manufacturing process of rubber stamps is a perfect platform for my designs, since the moulding plates are able to capture the most intricate details and the customer can enjoy images that are lavishly-detailed and full of design possibilities. I loved spending time with this theme, and look forward to seeing what crafts people do with them! Here are my 3 new stamp sets. 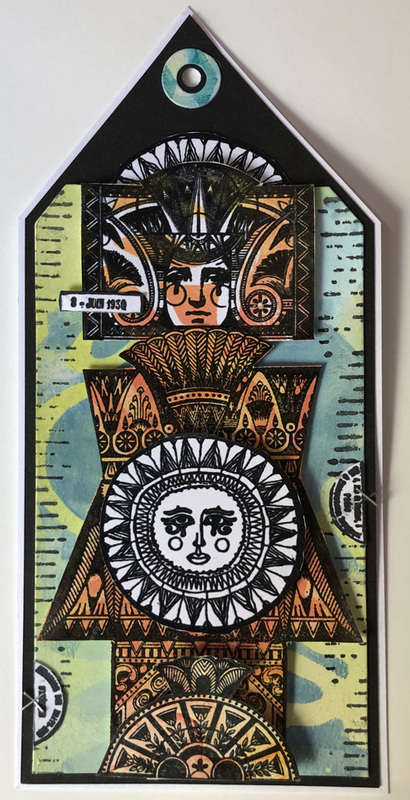 Here are some samples with each of these stamps sets that Lauren has made to give you a few initial ideas with these stamps. I love the way these amazingly detailed images work with colour. I've used first and second pulls from my gel-plate here so that some white space remains. I really like the contrast of the contemporary colours and stencilled backgrounds alongside Lynne's wonderfully strong focal images. Those faces! Wow! So powerful! 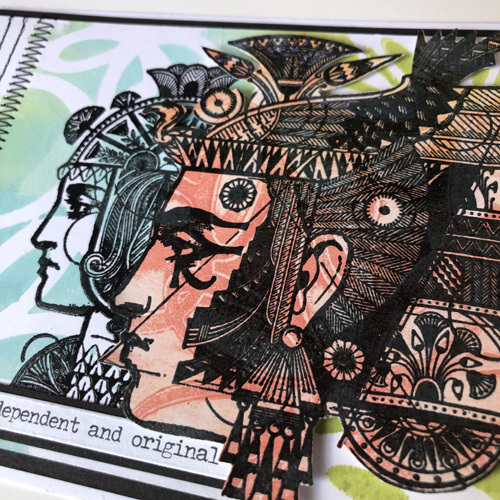 Perfect for uplifting journal pages and lots more besides.As my gel-prints were painted backgrounds, I found the Versafine Claire ink embossed in clear really popped on top of the painted layer and in real life you can see lovely depth and dimension. So many amazing images to layer up. The sun is one of my favourites. I particularly like it's steady gaze. I think it would be lovely to stitch it onto fabric or make an Artist's Trading Coin. 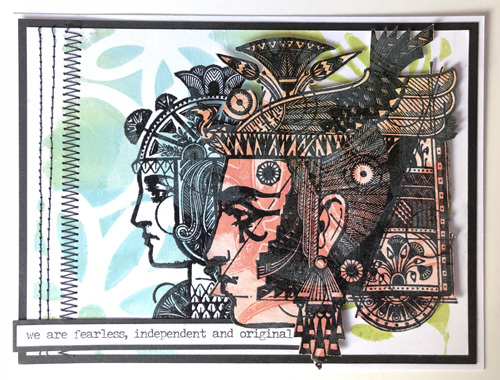 So many of the elements can be cut up and layered to create new collages too. Look at all the amazing details that make up every single stamp. You could really go to town cutting out different sections, or colouring them to really make the details pop. Every element has a value and several opportunities for originality in your work. I can never resist cutting things up to make something slightly different and there is a wealth of opportunity for that. They are endlessly versatile and already firm favourites of mine. There's that amazing Sun image again. Even fabulous in plain old black and white for a striking contrast!! Next step for me is using these stamps with my copic markers to pull out individual details in these images. Really looking forward to that! Below is a list of the retailers who order from us regularly. Please contact them directly to check if they will be ordering Lynne's stamps. 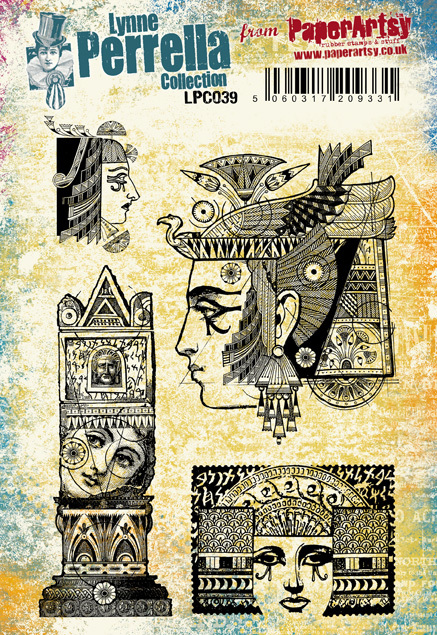 We are shipping stamps to stockists from October 1st. They are beautiful designs, Lynne, and great samples Lauren! 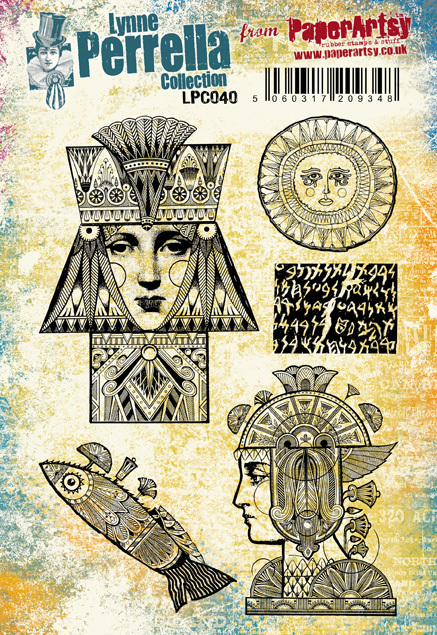 Such an awesome stamps- to me they look like mix between ancient history and steampunk! In love!!! Congratulations on the release Lynne. These are gorgeous. I love your samples. I. LOVE. THEM. These are going to be so much fun!!! These are gorgeous designs and the samples are amazing. What a fabulous release. What a fabulous surprise. Have been sulking about not being able to attend Lynnes classes in scotland. Another triumphant collection Lynne, and splendid artwork from Lauren! Inspired Design from Lynne Perrella. I loved reading the background to the stamp collection. Can't wait to get them for Time To Create in Australia. You kept that one very quiet! How exciting - love them! I too have been fascinated by all things Egyptian, what a treat to have these new sets released! Wow...Stunning and so very different new stamps. Amazing inspiration, thank you x. 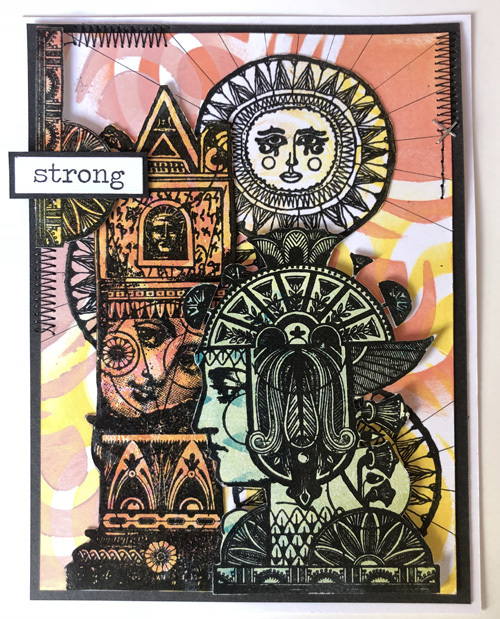 Love the bold colourful graphic look of your samples, Lauren - and the amazing dimensional layering of the images on the second piece is just brilliant. What an extraordinary release - so full of imagination and stories and beauty. 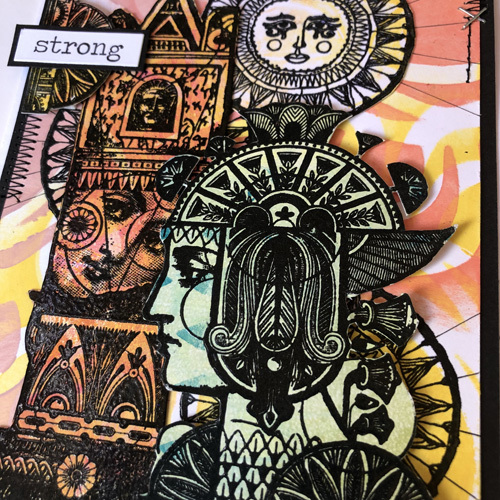 Thank you Lynne and PaperArtsy for another inspirational set of stamps. These are AMAZING! Stamps from Lynne! I cannot wait to get my hands on them! The only hard part is which ones to get first! Thank you Paper Artsy and thank you Lynne!! Fabulous new designs, how beautiful! And great samples by Lauren!